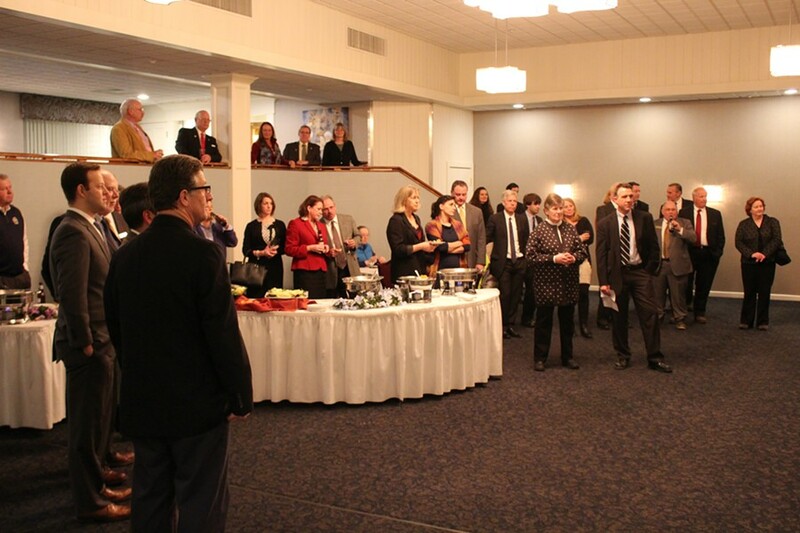 Forty lobbyists, lawmakers and former candidates gathered in Montpelier Wednesday night at a Republican fundraiser sponsored by tobacco, telecommunications and lobbying firms. 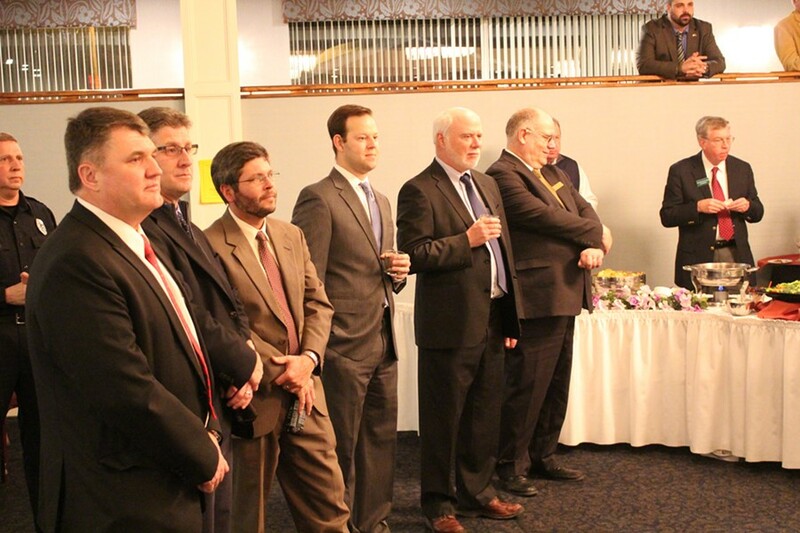 In a spare, over-lit room at the Capitol Plaza, contract lobbyists and their clients mingled around a buffet table, chatting with six of Vermont's nine GOP senators, a slew of House Republicans and Lt. Gov. Phil Scott. 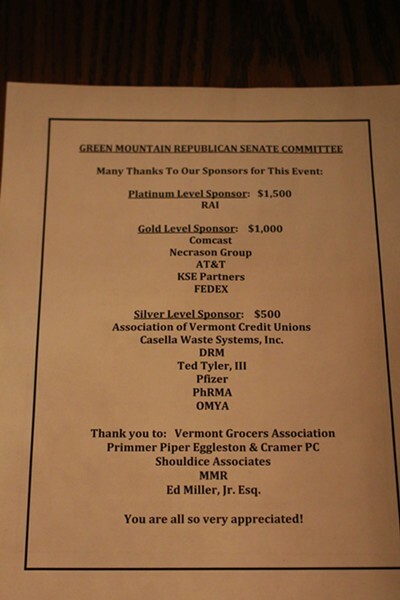 The event was hosted by the Green Mountain Republican Senate Committee, which raises money to finance its members' political campaigns. But Senate Minority Leader Joe Benning (R-Caledonia) and his colleagues said they were merely invited guests and played no role in organizing it. Benning was furnished with a list of corporate sponsors to thank when he took to a podium to introduce himself, Scott and House Minority Leader Don Turner (R-Milton). But, apparently noticing a reporter in the room, he opted against reading it. "I would normally at this point in time introduce all the fine folks that have brought this dinner and drink occasion to us, but all you gotta do is pick up tomorrow's Seven Days and you'll read all your names," Benning said. Platinum level sponsor ($1,500): Tobacco giant Reynolds American, Inc.
Silver level sponsors ($500): Association of Vermont Credit Unions, Casella Waste Systems, Downs Rachlin Martin, Ted Tyler III, Pfizer, Pharmaceutical Research and Manufacturers of America and Omya. Incumbent legislators were joined by several former candidates, including Rutland City Treasurer Wendy Wilton, who ran for state treasurer in 2012, Joy Limoge, who ran for a Chittenden County senate seat in 2014, and former senator Vince Illuzzi, who ran for state auditor in 2012 and now lobbies for the Vermont State Employees Association. Mark Donka, a Woodstock police officer who ran for U.S. Congress in 2012 and 2014, showed up in uniform with his service weapon holstered. 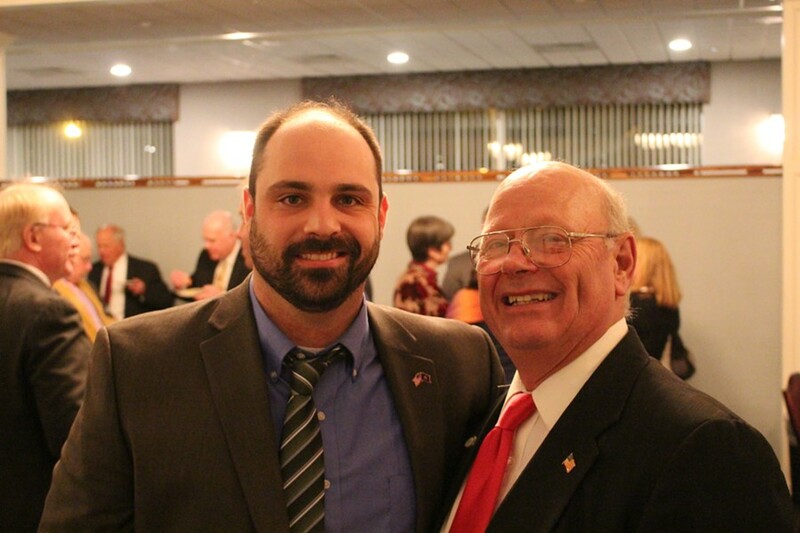 He said he was "fairly sure" he wouldn't run again for the House, but was considering running for state office. "There's all kinds of options," he said. "There's always options out there. It's just, we haven't decided which one we want to do." 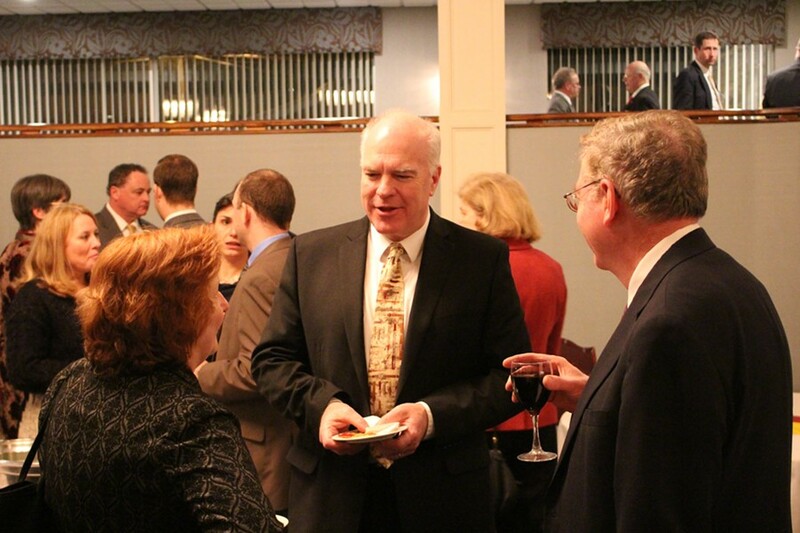 Also in attendance were a number of the Statehouse's top contract lobbyists, including MMR's Chris Rice and Warren Coleman; the Necrason Group's Adam Necrason and Rebecca Ramos; KSE Partners' Claire Buckley and Chuck Storrow; Downs Rachlin Martin's Joe Choquette, John Hollar and Lucie Garand; and Morris & DeMag's Allison Crowley DeMag. 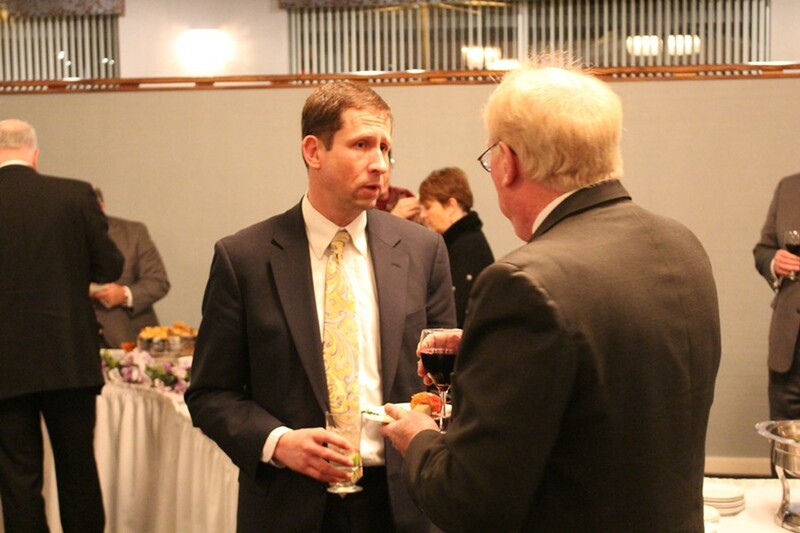 Some of the lobbyists, including Vermont Retail & Grocers Association president Jim Harrison, said the event was a harmless way for lawmakers and advocates to get to know one another. "I'm socializing and networking and, shortly, on my way home," he said. But, somewhat surprisingly, several senators indicated that the event made them feel uncomfortable. Sen. Kevin Mullin (R-Rutland), who chairs the Senate Committee on Economic Development, Housing and General Affairs, said he believed such fundraisers were often used — at least by Democrats — as a means of selling access. "I know from several people that have told me stories about how if they want to get before a committee, they're supposed to come to some of the Democratic fundraisers," he said. "That goes back a few years." Mullin said he knew "regular citizens" who were advised by lobbyists that they ought to contribute money to political campaigns in order to "get people's ears." As such, Mullin said he was planning to support legislation introduced last week by Rep. Kurt Wright (R-Burlington), Patti Komline (R-Dorset) and a tripartisan group of colleagues. The bill would ban political action committees and parties from raising campaign cash while the legislature is in session. Currently, lawmakers themselves are barred from doing so, but they can legally launder the money through PACs like the Green Mountain Republican Senate Committee. House Democrats and Republicans alike engage in the practice, but Senate Democrats have ceased raising money from lobbyists while legislators are in Montpelier, according to Senate Majority Leader Phil Baruth (D-Chittenden). Wright's and Komline's proposal found support from a surprising number of lawmakers Wednesday evening. 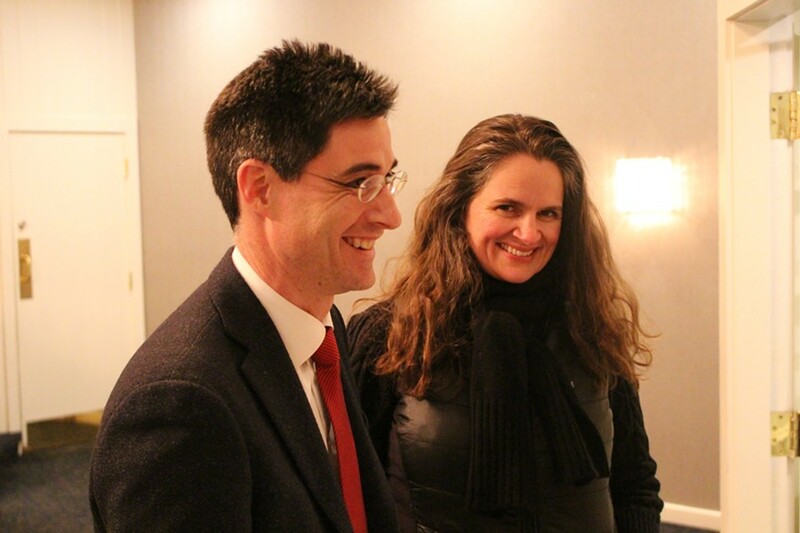 Scott, who accepted contributions from many lobbyists during his last reelection campaign, said he thought such events were a good opportunity to speak with Vermont business owners. "You know, we live by the rules that we have right now," he said, adding, "It wouldn't bother me to see them change, but until they do we'll keep playing by them." Asked specifically whether he would back the bill cosponsored by Komline, his former campaign manager, Scott said, "I support that. Sure." "I think it gets a little messy — just because of questions like this," Scott said. "When you take a look at this, then you know people are suspicious of what you're doing." Even Benning, the fundraiser's master of ceremonies, said he supported banning such events in the future. In fact, he said, he was planning to introduce a Senate version of Wright's and Komline's bill. "We're all scratching our heads wondering if this is the kind of thing that should be happening during the session," Benning said on his way out the door. "And right now both sides are doing it, so both sides are gonna say, 'Well, it's perfectly legal,' but there are several of us who have raised the question: It could look better than it does." Necrason and Ramos, who were retrieving their coats as Benning prepared to leave, didn't have much to say about their attendance. Asked what brought him to the event, Necrason said, "Honoring democracy." "Don't talk to the press," Benning said with a laugh. "Be careful." "Yeah, public service," Necrason continued. "You heard [Scott's] speech: It was really inspiring." And how much did the lobbyist pay to "honor democracy?" "It's on the disclosures," Necrason said. "We're all trying to avoid you," Benning interjected. "Can't you figure that out?" Should Vermont Legislators Go to Work for Those Who Lobby Them?